Since the prior five years have been extremely rewarding in every way I can think of, I am once again taking on fundraising and running for Credit Unions Kids at Heart to raise money for the children who are patients of Boston Children's Hospital. The Credit Unions Kids at Heart team and its coordinators have worked endlessly to raise money for life saving research that can ultimately change and save the lives of so many children, especially many of the patient partners on our own team. We are hoping that by raising money and awareness for the research, and ultimately a cure for Moyamoya Disease, Sturge Weber Syndrome, Pediatric Brain Cancer, Cerebral Palsy, and Pediatric Epilepsy we can help the patients and their families that live and cope with this on a daily basis. Making their lives even a little bit easier can make significant changes in their day-to-day lives. I am so honored and lucky to partner again with my little superhero. Drew and his entire family encompass what it is to love and be loved unconditionally and make Drew a part of a world bigger than his so that everyone he comes in contact with can have the pleasure of knowing him and his beautiful smile. Drew's life is far from easy or the typical life of a five year old child. Drew suffers from a rare genetic disorder called GRIN2A. He also has Cerebral Palsy. This disorder leaves him with multiple impairments mentally, physically and visually. Drew also suffers from Epilepsy. Drew has been receiving care from Boston Children's Hospital for over four and a half years of his young five years of life. Drew's parents say that he has an amazing team at Children's, especially his neurologist. They have Drew enrolled in a clinical trial for his epilepsy and a mouse with Drew's DNA is at Emory for research. Drew's family feels extremely fortunate to live so very close to one of the best hospitals in the country! To say that I am honored to run for Drew and his family and for this amazing team would be the least of what I could say. It is staggering to know that all money raised goes 100% towards the research of these diseases! To see these children and know how much they go through on a daily basis gives myself, and I am sure my teammates, the drive to push through and train and find creative ways to raise funding for such worthy causes. These families have a lot going on in their own lives but they are there to support us every step of the way. They also know, that the money raised not only has the possibility of changing their child’s life but the lives of the other children as well, and someday that there may be a cure or better medications. With research and funding, and one of the best hospitals in the country with its top doctors and nurses, the possibilities are endless. 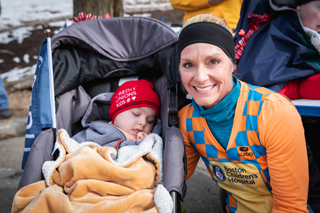 I want to thank you all ahead of time for your support as I train with my team and take on the 2019 Boston Marathon for Drew, his family, and all the other children and their families that are fortunate to use the services of Boston Children's Hospital. Your donation makes such a difference and impact to those patients and their families who are patients now and those that will need the services in the future thanks to the research that has been funded by your generosity. Thank you from Team "Lots of Sole"
Thank you so very much for not only taking the time to read this but for making a difference. Your support, no matter what amount, always makes a difference and it is GREATLY appreciated! !